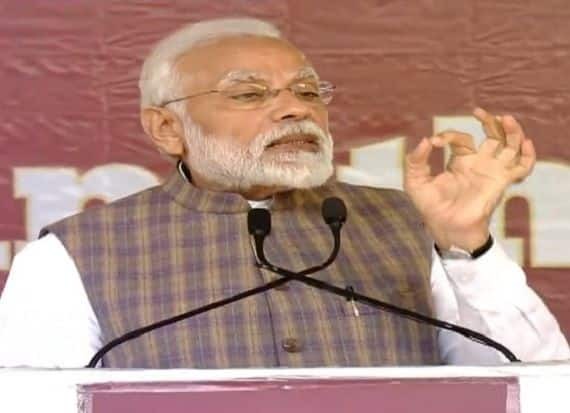 Addressing a public meet in Uttar Pradesh's Vrindavan on the occasion of Akshaya Patra Foundation's third billionth meal today, PM Modi said that the government is committed to holistic development of underprivileged children. PM Narendra Modi in Vrindavan. New Delhi: After inaugurating the Petrotech Expo Mart 2019 in Greater Noida on Monday, Prime Minister Narendra Modi reached Vrindavan to commemorate Akshaya Patra Foundation’s third billionth meal. Funded by the International Society for Krishna Consciousness (ISKCON), Akshaya Patra is a Bengaluru-based not-for-profit organisation that works with the government on mid-day meal schemes. The prime minister served food to about 20 schoolchildren from underprivileged background in the campus, marking the three billionth meal offered by Akshaya Patra. The prime minister will also pay floral tribute at the the Vigraha of Srila Prabhupad, the Acharya of ISCKON. Twelve LED screens have been put up for the audience and 70 mobile toilets, four VIP washrooms have been arranged for the event, organisers said. “In Gujarat, where we are a partner for the Mid-Day Meal Scheme, all government schools will be hosting the streaming. So, people will join on the ground and online for the big event,” Dasa said. A silver ‘patra’ (container), as symbolised in our logo, will also be gifted to the prime minister, Dasa said.